Of all the things I truly dislike writing about, singleness tops the list. But this isn’t about being single, not really. This is about how even when we feel forgotten, we’re anything but. This is about how we’ve been given every good thing we could possibly need for right now, this present moment. 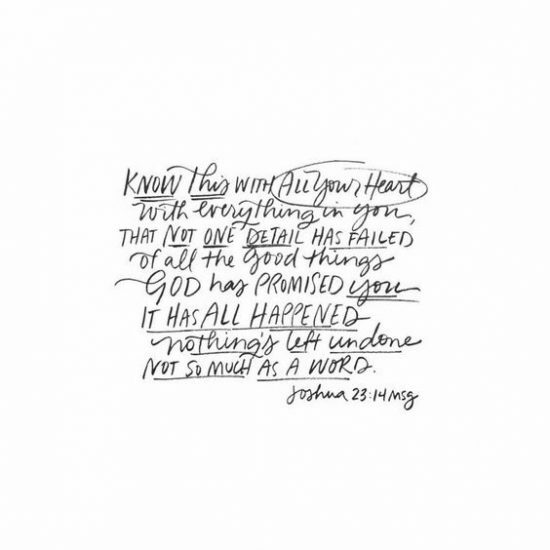 This is about God’s timing and a story larger and wider and deeper than we could imagine… a good story He’s invited us into. I’m not sure where you find yourself as you read these words. I’m posting them on Valentine’s Day morning, but maybe you’ll stumble across them on a mid-March afternoon or in May when everyone graduates and you’re left holding a handful of questions. I don’t know if you’re single, married, dating, divorced, or widowed. I don’t know the ways your heart has broken, the questions that keep you up at night, or the joke that never fails to make you laugh out loud. But I do know this: You have dreams worth dreaming. You are seen, known, valued and dearly loved — all of you, as you are, right now. Maybe that’s hard to believe. Or maybe you can read the words, even hear the words and believe them for someone else, but you struggle to claim the truth for yourself. I get that more than you know. Would you allow me to share with you a letter I wrote? Maybe it’s for you, but it’s certainly for me. If you’ve watched dreams unfold for your friends as you quietly sat by… If you’ve done the work but the doors didn’t open… If you continue to put yourself out there but are only met by the sound of silence… If you struggle to keep praying for the same thing… If you’ve joyfully stood with bare feet in the grass or heels on a stage, wearing a bridesmaid dress as you wonder when it will be, as other people are prone to say, “your turn”… If you wonder if God forgot you, if He heard your prayers for a husband, a baby, a job that pays the bills, a book deal, a medical miracle… this letter is for you. Of all the chapters in my book Even If Not: Living, Learning, and Loving in the in Between, chapter eight was the hardest to write. It’s about dreams and hopes that may never come to be… it’s about choosing to trust the Giver of the dream “even if not,” even if the dream isn’t realized. For me, it’s marriage and motherhood and, quite frankly, there’s no bow to wrap the chapter up nicely. In many ways, I feel much like I’m back at the final sentence of chapter eight with this post, this letter. I know it’s meant to go out into the world, and yet it feels a bit unfinished, raw and all too vulnerable. 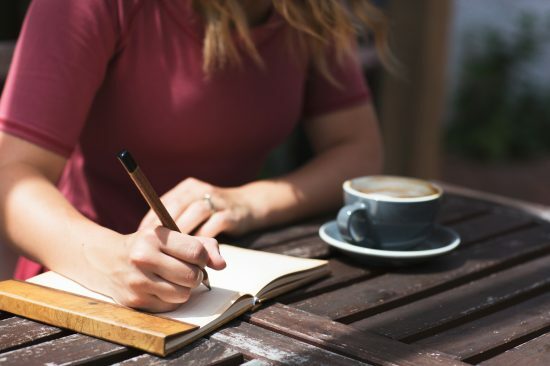 I’m writing it to you, but I’m writing it to myself as well. As with my book, I hope and pray (truly, many prayers were prayed over these words) it blesses you and any women who may need this encouragement. I wish I could sit with you today, reach out and cover you with a blanket, offer a cup of coffee or tea, a listening ear. If I could, I’d hold your hand, look into your eyes, and promise not to flinch if you feel comfortable enough to speak your truth into the space between us. I see the determination in your eyes, the fierce loyalty you give to those you love, the steadfast spirit within you. I see the way you’re quick to serve, to rearrange your life to give more of yourself when someone is in need. I see the quiet hope you carry and I see how the joyful laughter you let loose into the world changes the world. Your life is one long prayer lived out, and I see it. I also see your chin quivering, the tears threatening to spill, your hands twisting in your lap. I hear the unspoken questions that hang in the air. Let the tears fall, dear one. Having a tender heart is a strength, not a weakness. Vulnerability takes true courage. You were never meant to hold all the answers, so lean into the unknown but know this: You have not been forgotten. You didn’t miss the boat, no matter how “behind” you feel, no matter what chapter you find yourself in. You are adored, not abandoned. Can I tell you a secret? No one really has it figured out. Everyone, in some way, feels overlooked, forgotten, unsure. We all doubt. We all wonder. We all wait for something or another. But most people, they don’t talk about it. Instagram is filled with filtered pictures, snaps of good hair days and engagement rings, pregnancy announcements and job promotions. I’m not knocking Instagram, because I know you love it as much as I do, but let’s be honest… it’s easy to compare our behind-the-scenes to someone else’s highlight reel. We’re all struggling, we’re just not all talking about it. Your story is good — right now, in this chapter. It is beautiful. It is not a mistake. (You are not a mistake.) Your story matters long before there’s a bow to wrap things up. There’s beauty in the ordinary, in the regular, in the messy middle and in every in between. There’s a verse that has comforted me, and I want to share it with you. Psalm 9:10 says, “Those who know your name trust in you, for you, Lord, have never forsaken those who seek you.” The Message translation says it this way: God is a safe-house for the battered, a sanctuary during bad times. The moment you arrive, you relax; you’re never sorry you knocked. Even when no one is around, even when it’s just you, an empty room, and a scrolling social media feed, you are not alone. 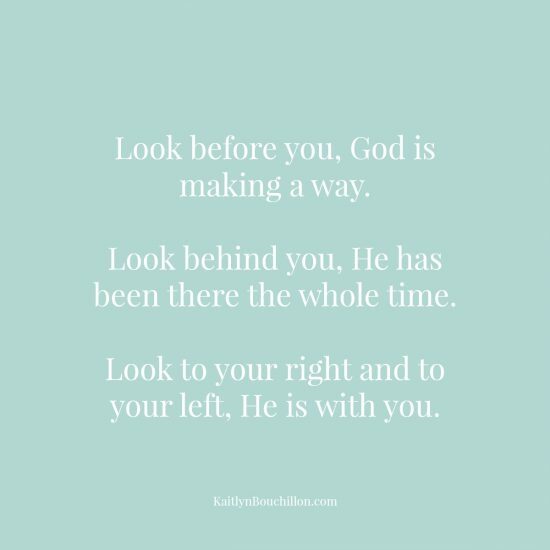 Look before you, God is making a way. Look behind you, He has been there the whole time. Look to your right and to your left, He is with you. You will not miss what God has for you. What seems like the last minute to us is actually right on time to God. He won’t delay; He won’t be late. Don’t worry, I won’t offer any of the lines I know you’ve heard one hundred times. People mean well, bless their hearts… but I’ll be the last to say “don’t worry, you have more time” or “enjoy these days because you won’t get them back.” Because I know it just like you do, agreeing with these statements doesn’t take away the ache. Sometimes the well-intentioned questions leave you feeling like all of life is a waiting game, one long drawn-out pause until XYZ happens and the page turns. If you’ll allow me, I’d like to share what comforts me when I feel like I’ve been forgotten, abandoned, or left behind. I pray that it doesn’t pour salt in any wounds or rub up against your bruises. I really do believe that there is a reason for every season, as cliché as that sounds. God is never early, but neither is He late, and so I have to believe that He is for me and for you, that He does not make mistakes and so therefore He has us exactly where He wants us. 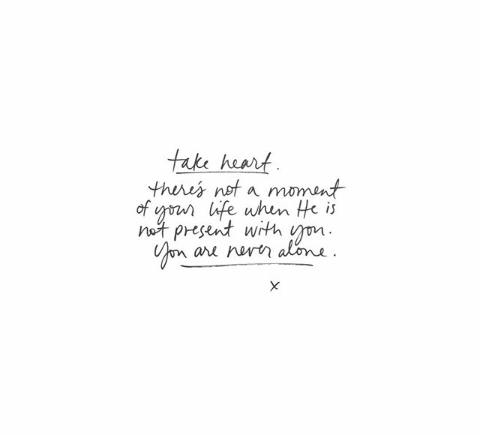 You are not even one centimeter off course, friend, because He is your guide. He won’t lead you the wrong way and He won’t keep what is best for you from you. No, you’ve already got it all. I see you. I see the beautiful broken and the daring hope that just doesn’t quit. And I see the shimmer of doubt, the wondering and the questioning of “what if” and “why” and the quiet lie that so easily slithers into the mix, beginning way back in the garden: I’m missing something good. God is holding out on me. But He is not, dear one. He loves you, sees you, created you, calls you worthy and lovely and chosen. He knows the desires in your heart and His plan is good. His plan is good. What you’re hoping and longing for, praying and dreaming about, might be right around the corner. When it is the exact right time, He will move the pieces on the board, connect the dots, or lead us elsewhere. In the mean time, in the right now, refuse to hit pause. Give it time, but don’t waste this time. Instead of rushing, wait with hopeful anticipation. When you want the quick fix, the easy answer, rely on Truth. The world keeps on spinning on its axis, thanks in no part to you or I, and the sun will rise again tomorrow. There’s a new morning coming with fresh mercies, and this isn’t the page on which your story ends. He knows what He’s doing and His timing is right, exactly what you would choose if you could see the end of the story from here. 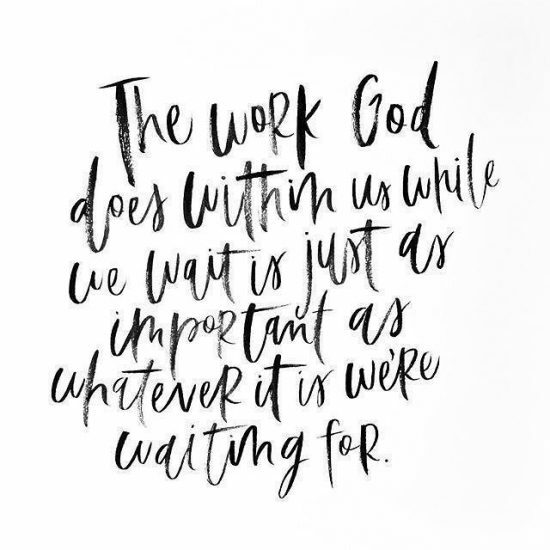 The work God does within us while we wait is just as important as whatever it is we’re waiting for. And God would not have you wait unless He saw it good for you to wait… for reasons we may never know. But this you can know: You are not forgotten while you wait. In every empty room, there’s a Friend on your side. In every goodbye, He refuses to let go. He sings over you through the sleepless nights. You are missing no good thing. His very best is all around you, surrounding you on every side, because His presence is Every Good Thing and you’ll never go without. I promise to be here to hold your hand, to wipe the tears that fall, to listen to what is spoken in the silence and to dance it out when all that can be said has been said. I’ll write notes on the mirror, put letters full of Truth in the mail, and pray when you can’t form the words. I’ll remind you of what is true when you just aren’t sure anymore. You, dear one, haven’t been overlooked. You haven’t missed the boat. You are not too late, not too much, and never forgotten. May the deep peace of Christ be with you, the strong arms of God sustain you, and the power of the Holy Spirit strengthen you in every way. Beautiful! Words we all need to hear at one time or another. Sometimes more than once. Such lovely encouragement here. We all experience the shadow of loneliness from time to time. Yes, even us married ladies. God is so good to remind us in His word that He has us. Visiting from Faith and Friends link up. This is the truth of God’s love. He is our Keeper-Psalm 121. We so often need to be held in those moments when life leaves us feeling so abandoned and He is always faithful to be there. Thank you so much for these beautiful words sharing His love. Ah, I hope God was singing to me with your beautiful post. I have felt forgotten and like the pictures He has shown me will never come to fulfillment. I love the reminder that everything could shift and change in any given moment. Thank you, Kaitlyn. 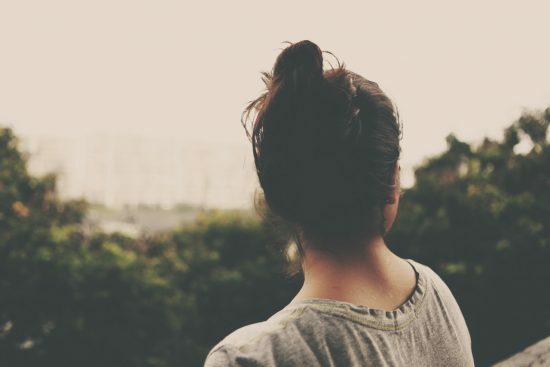 I taught a women’s Bible study for a long time and these issues always came up. I tried to help them see that loneliness and isolation can visit anyone, in any station of life. We have to deal with the root and not look to others to fill us. Only Jesus can adequately, and forever, do that! Thanks!! Love you and your beautiful, powerful words. Thank You doesn’t seem enough. But thank you friend!